One Inch Sheet 200 Vale of Evesham & Stratford 1892 - published 2000; introduction Robert Bearman This Inch to the Mile map covers pa..
Warwickshire Sheet 44.06 Stratford on Avon 1885 - published 2015; intro by Barrie Trinder. 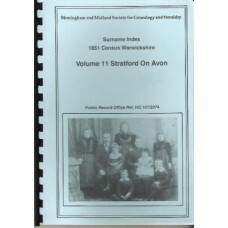 ISBN.978-1-84151-866-6 This detailed map..
Stratford-Upon-Avon Holy Trinity Baptisms 1558 -1652Marriages 1558 -1812Burials 1558 -1653 This is a downloadable pdf file (approx. 47.0MB, 6..